The Bill for an Act to Provide for the Inauguration of the President and Vice President of the Federal Republic of Nigeria, also known as Presidential Inauguration Bill, 2016, was read a second time by the Senate in plenary, Thursday. The Bill, sponsored by the Deputy President of the Senate, Senator Ike Ekweremadu, seeks to align presidential inauguration in the country with international best practices as obtained in the United States of America, USA, and many other democracies. Leading the debate on the general principles of the Bill, Senator Ekweremadu explained that the Bill seeks to move the inauguration of the President and the Vice President from the Eagles Square to within the precincts of the National Assembly, but without precluding the Chief Justice of Nigeria from swearing the President and Vice President. Addressing the Senate, Ekweremadu explained: “Mr. President, Distinguished Colleagues, you would recall that Nigeria transformed from operating a Parliamentary- Westminster system- to the extant Presidential system modeled after the U.S. Presidential system of government in 1979 and continued to the 4th Republic from 1999 to date. “You would also recall that from the commencement of the 4th Republic to 2015 the inauguration or swearing-in of the newly elected President and the Vice President of the Federal Republic of Nigeria had been taking place at the Eagle Square. This practice of inauguration of the President and the Vice President at the Eagle Square is at variance with what transpires in the United States and other democracies where their Presidents and Vice Presidents are inaugurated within the precincts of their Parliaments. “Thus, as you can see, this is a misnomer. The popular or international best practice is for the leadership of the Executive to be inaugurated within the premises of the Legislature, who are perceived as the true representatives of the people. Suffice it to say that this practice does not preclude or extricate the Chief Justice of Nigeria from administering the Oath of Office on the two”. The Deputy President of the Senate, noted that the Bill further provides for the inauguration ceremony of the President-elect and the Vice President-elect to take place at the Arcade of the National Assembly, where the people are represented. He said it also provides for the setting up of a Presidential Inauguration Committee, which shall consist of a serving Member of the National Assembly as Chairman, six members drawn from the Legislature, two from the Executive, two from the Judiciary, and two from the Civil Society. Section 7 provides for order of Procession with the President leading, while former Presidents, former Heads of State, former Heads of Federal Government, former Vice Presidents, Former Senate Presidents, former Speakers of the House of Representatives, and former Chief Justices of the Federation, follow, accordingly. 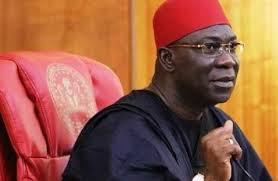 Ekweremadu also explained that the Bill further provides for the President-elect and Vice President-elect to be the last to come, accompanied by their immediate families and also to be supported by their spouses, serving President of the Senate, and the Speaker of the House of Representatives at the point of swearing-in. The Senate in plenary presided over by the Senate President, Senator Bukola Saraki, approved for the Bill to be read a second time and subsequently referred it to the Senate Committee on Special Duties for further processing. The Committee is to report back to the Senate in four-week time. Meanwhile, the Presidential Inauguration Bill was earlier sponsored by Senator Jubril Aminu in 2009 and passed by the 6th National Assembly, but did not receive presidential assent.